Away draw specialists Fylde shared the spoils for the fifth time in six National League matches on the road this season. The 67 Coasters diehards who made this latest epic journey south saw Danny Philliskirk's first goal for the club cancel out Shaq Coulthirst's first-half strike in north London, where Danny Rowe almost turned one point into three when he struck a post at the death. 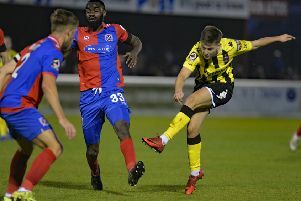 Manager Dave Challinor made one changed from the side which accounted for Aldershot as Arlen Birch replaced the injured Luke Burke. Jim Kellerman forced home keeper Mark Cousins into the first save of the afternoon after 15 minutes at The Hive but it was the hosts who took the lead five minutes later. Coulthirst fired his shot into the right corner of the net from the edge of the area. The lead lasted only five minutes, however, until Joe Cardle's teasing cross was headed home by the unchallenged Philliskirk. The remaining chances of the first half fell mostly Barnet's way but they couldn't find a way past keeper Jay Lynch again. First the Fylde number one saved Wes Fonguck's effort from the edge of the box on 28 minutes, then kept Jack Taylor's effort out before Charlee Adams shot straight at him. The first clear-cut chance of the second half went Fylde's way just before the hour, when Tasdemir's fine ball released Rowe but the striker's tame effort didn't trouble Cousins. Fylde should have scored on 70 minutes but Cardle fired wide from close range after Cousins had parried Tasdemir's effort into his path. Still unbeaten on their travels, it could have been an even better result for Fylde when Cardle's cutback found Rowe but his rocket shot struck a post with three minutes remaining. Barnet had a chance to ruin Fylde's day in the last minute, when David Tutonda volleyed wide from the edge of the area. The Coasters slip a place eighth ahead of Tuesday's visit to Halifax Town.